Worship on Sunday is the heart of our community life at St. John's and we welcome everyone to join us for worship. Our worship style is traditional. The order of service is from the Book of Common Prayer of the Episcopal Church. The 8 AM service follows Rite I with no music. The 10 AM service is in Rite II with hymns and organ and choral music. Prayer is central to our common spiritual life. Everyone is welcome to our week day services of Morning and Evening Prayer. These prayer services originate from the ancient monastic practice which was later adapted by the Book of Common Prayer. Sermon is an important part of our worship experience. 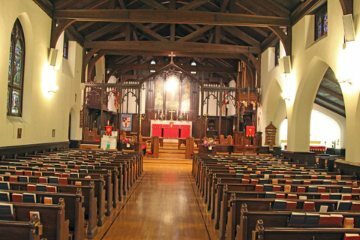 Preaching at St. John's is scripture-based, inspiring and thoughtful, and engages the spiritual and faith issues of the modern day life. The Gospel message--the Good News of God in Jesus Christ--is the central message delivered in preaching. We love good music, both traditional and contemporary. 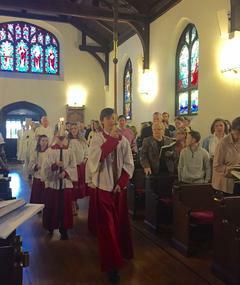 The adult choir sings every Sunday, and the youth choir joins in once a month. Our folk band, The Prospect Street Band, makes an occasional appearance. There are also many opportunities to help and serve in worship as Acolytes, Lay Eucharistic Ministers, Lectors, Ushers and on the Altar Guild. Come and worship with us.